At this sports centre you can go weight training, have an aerobic work out, jion a fitness class or hire indoor and outdoor courts. There are indoor and outdoor courts that you can use for football, badminton, basketball, volleyball, cricket or netball. They also have table tennis tables and a dance studio. You may want to join a keep fit class - there's something for every one! If you or your group would like to try one of these sports then contact the centre and ask for a taster session. A personal trainer can be there to support you. If you like what you try and want to use the centre more you can get membership for a year. If you live in Walthamforest the staff here can support you to fill in a Forest Connection card form to get cheaper prices. Kelmscott leisure centre is a non-smoking area. If you want to use the centre as a group its best to book a week before you go. and the afternoon (3.00 am to 5.00). Saturday and Sunday are all day. and afternoon (11.00 pm to 3.00 pm). If you have a forest connection card it costs £2.70 to use the Gym at peak times and 1.90 at off peak times. If you have a forest connection card it costs £2.70 at any time. If you don't have a forest connection card it costs about £4.70 at any time. 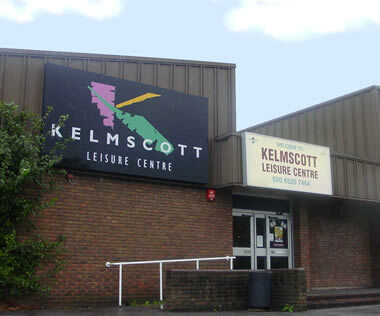 Kelmscott Leisure Centre is next to Kelmscott school. There are 3 accessible parking spaces for people with disabilities - they are outside the entrance. It is a large car park. ________ are the nearest fully accessible buses. ________ are the nearest fully accessible night bus. (Victoira line) Walthamstow Central underground station is the nearest underground, from there you need to catch a bus to Kelmscott Leisure centre. Walthamstow Central underground station is not accessible for wheelchair users. St James street mainline station is about 750 metres from Kelmscott leisure centre. Call National Rail Enquires on 08457 484 950 for access information. The main entrance is flat through double automatic doors. They are 805 mm wide. The minimum doorway is 805 mm wide (entrance doors). The centre is all on ground level. There is a lot of space to move around and it has good lighting. There are vending machines at the reception. A bottle of water or coke costs about £1.00. There are chairs near reception. The doorways into the changing rooms are over 900 mm wide. They do not have non-slip floors. There is an accessible changing room inside the Men's and Ladies' changing rooms. It is kept locked, the key is at reception. Inside there is a shower with a fold-down seat, an accessible toilet with handrails and a bench seat. There is a lot of space to move around. If you are coming as a group you may like to contact the centre and book your own changing room. The accessible toilets are inside the hallway of the Men's and Ladies' changing rooms. Please see above for details. The staff were really friendly and helpful on our visit. You can get GP referals, contact Kelmscott leisure centre to find out how.